Greg Richmond Takes Local Control From Illinois. Next Stop, New Jersey. Greg Richmond, CEO of the National Association of Charter School Authorizers, would like you to believe he knows what New Jersey's public school system needs. Pay particular attention to this section of his NJ Spotlight editorial. Now let's look at the model legislation NACSA has been pushing, the Charter School Growth with Quality Model Legislation. Up until recently they were pushing this legislation through ALEC, until the tides turned and people wised up to the fact that corporate America was buying legislation in state after state. In January of this year, Richmond wrote a piece for Inside ALEC, in their special "Policy Overview for 2012" edition, called "Attracting Innovation in Education through the Charter School Growth with Quality Act Model Law." In the piece, Richmond does not attempt to hide the true purpose of this legislation - to side step any semblance of local control over public education in communities that have rejected charters. One of the states to adopt this legislation just happens to be Illinois, Richmond's home state. Before Richmond became the CEO of NACSA, he worked for the Chicago Public Schools for a decade. From 1994 to 2005, Richmond worked for the Chicago Public Schools, where he established the district's Charter Schools Office. Under his leadership, Chicago was the first urban school district in the nation to release an RFP, requesting educators and community organizations to start charter schools. He also established the nation's first district-funded capital loan fund for charter schools and developed model accountability and monitoring practices. With Richmond and Duncan working together, charters flourished in Chicago, and there are now over 100 charters in Chicago alone. But the Washington Post pointed out, according to the National Assessment of Educational Progress (NAEP) scores, Chicago wasn't really fairing better than any other large urban district. I have written previously that Carlos Perez, the CEO of the New Jersey Charter Schools Association, came to us by way of Chicago, where he was the President of the Illinois Network of Charter Schools (INCS). He gave an interview to John Mooney when he came to NJ, and talked about how hard it had been in Illinois to make progress and how much better it was going to be in NJ. Why was Mr. Perez frustrated? Seems that he, Richmond, and Duncan were wildly successful packing Chicago with charters, but didn't have such great luck in the rest of the state because, until now, districts had the ability to approve or deny charter applications. Check out this map on the INCS website. Look at the density in Chicago, and then look at the rest of the state. Traditional public school districts in Illinois were given the option to chose charters, and most outside of Chicago chose not to. Not to be thwarted, NACSA, led by Greg Richmond, with the help of ALEC, got the Illinois Legislature to pass the Charter School Quality Law, Public Act 097-0152, which, just like the model NACSA legislation, establishes a State Charter School Commission. Under the new Illinois law The State Charter School Commission has been formed, and will be able to override the decisions of local schools boards. And guess who's the Chairman of the Commission responsible for making these decisions?? So the guy who works for NACSA, that wrote and lobbied for the legislation, gets to chair the Commission that will carry out the legislation? Seriously? Welcome to ELSEWHERE, New Jersey! Clearly Richmond has his sites on our public education system, and in today's NJ Spotlight there is also talk of sweeping reforms of New Jersey charter school law. Don't be surprised if the idea of a State Charter School Commission gets thrown into the mix. And if it does, don't believe the hype. It's not about kids. Let Illinois be a warning. The reformers in New Jersey and the out of state "experts" they bring in will not stop once they have saturated, as Richmond puts it, the "five largest urban school districts in New Jersey." They will not stop until the entire landscape of our state is littered with charters, whether the democratically elected local school boards or the majority of local parents and residents want them or not. Below is the testimony I prepared and (sort of) delivered for the Senate Judiciary Committee regarding the nomination of Commissioner Chris Cerf. Senator Doherty went on for what seemed like an ETERNITY (Check out Jersey Jazzman's timeline - it was at least 40 minutes of the five hour ordeal) but the five citizens that testified had their microphones abruptly turned off at exactly the three minute mark. It felt a bit hostile and unnecessary. Sitting in the room during the questioning it was hard not to notice how perfunctory it all felt. Yes, yes, here is the question I should ask about (fill in creepy thing Cerf has done here). But there was no probing. No real challenge. No teeth. Oh, except on his residency. Senator Scutari really dug his heels in on that one. Sen. Nicholas Scutari (D-Union), the committee chairman, said Cerf’s answers about his residency nearly kept him from voting to affirm the nomination. Scutari said Cerf may have perpetrated "something like fraud" by not being truthful about his motivation to move. Earlier this year, Cerf rented an apartment in Somerset County that is closer to his job in Trenton than the home he shares with his wife and children in Montclair. Cerf said he rented the apartment in Montgomery because the area was "charming" and the rent was "reasonable." Scutari said he didn’t buy it. He said the committee should be "insulted" by Cerf’s deception. The real reason for Cerf’s move, he said, was a need to get out of Essex County because of Rice’s decision to block the nomination. The unwritten senatorial courtesy rule allows senators to block gubernatorial appointees who reside in the counties the lawmakers serve. "If you had sat down and said ‘I moved because of Senate rules or senatorial courtesy or Senator Rice and I had to get a residence somewhere else,’ that’s one thing," Scutari said. "For you to sit here and tell us you moved to be closer to work when you have a driver, I cannot accept that answer." I could give you a couple dozen answers he gave that were just as disingenuous. Many of the Senators just skimmed the surface on substantive issues like Christie and Cerf's back handed attempt to change the funding formula through the budget, the drastic change in Newark's QSAC scores, the approval of virtual charter schools without any authority to do so, and on, and on, and on. To me it felt like the Senators knew they had already been bested in that knife fight before they took their seats at the hearing, and despite all the very real issues with Cerf (his extensive for-profit, Broad-ified background for example) they had no choice but to approve his nomination. Clearly, this was a done deal and clearly no question asked or answer given was going to change the outcome. I suppose it is supposed to comfort the parents of New Jersey that Cerf says he is "not going to do anything but what's right for kids." I honestly wonder what he thinks parents like me are trying to do when we run into the brick wall that is his NJDOE? Good Morning Senators. My name is Darcie Cimarusti, and I would like to take a few minutes of your time to relate my own personal experience with the New Jersey Department Of Education, and what I think it means about the nominee before you today. I am the mother of two students in Highland Park Public Schools, and in March of 2011 I became an active member of a group of concerned parents and residents who were opposed to the approval of the Tikun Olam Hebrew Language Charter School. When I began volunteering my time, I had no way to know what I was in for. I don’t want to bore you with too many of the details of my story; you have much to consider today. But I came here today to let you know that my story boils down to one simple truth; traditional public school districts and parents have NO VOICE in Acting Commissioner Cerf’s Department of Education. Districts are given the opportunity to respond to applications, but their responses are summarily ignored and disregarded. The opposition of a traditional public school district is written off as the keepers of the status quo resisting competition, innovation, and change. And parents that support their public schools and don’t want to see them dismantled one charter at a time have no voice whatsoever. The only way I was able to give voice to my community, and the other communities that would have been affected by the application, was to relentlessly pursue the press, because our cries fell on deaf ears at the NJDOE. We submitted multiple binders filled with analyses of the applications, letters of opposition from hundreds of parents and residents, and petition signatures from thousands more. But none of it mattered. We were ignored, and the applicants were not only encouraged to reapply, they were given assistance to improve their application. Which is why we not only aggressively pursued the press, we held a Town Hall meeting, and organized the “Occupy the DOE” protest with concerned parents from across the state. Yet STILL we were ignored. Other than for an occasional snarky quip from an NJDOE press secretary about how community input is carefully considered in the application process, we were stonewalled. This is why I am here today. I hope that my experience with Acting Commissioner Cerf’s DOE illuminates for you the need for Chris Cerf, whether he has the “Acting” before his title or not, to be accountable to ALL stakeholders in this state. And that includes the parents of traditional public school students who are trying desperately to defend our schools against unwanted and unneeded reforms. The Acting Commissioner’s charter agenda has been outright rejected by the parents in this state who are proud of the world-class education our children are receiving. But it is crucial to remember that these same reforms that have been rejected in suburb after suburb are no less troublesome in our urban districts. While reform is certainly needed in many of our struggling districts, the supposed shining examples of successful charters are simply not replicable for all students. They do not and will not serve the majority of our state’s most vulnerable students. Instead, they will effectively defund their traditional public schools, leaving them trapped in unsafe facilities with too few resources, including too few teachers, who are increasingly forced to narrow curriculum to teach to standardized tests, in a vain attempt to avoid the devastating consequences that come with being labeled a Priority or Focus school. In Highland Park we were incredibly lucky that our determination and steadfast resolve to speak up for our traditional public schools paid off. Education columnist Michael Winerip ultimately told our story in the New York Times, and with his weight behind us we were finally granted a meeting and were able to tell our story directly to the NJDOE. The application was denied for a fourth time, and as of today the applicants have not reapplied. Pressure from communities like Highland Park, Cherry Hill, Voorhees, Montclair, and Teaneck have pushed Acting Commissioner Cerf’s charter agenda out of the suburbs, at least for now. Without local democratic control, the push for reform in places like Camden, Newark, Paterson, and Perth Amboy is no less dangerous. Parents and teachers in those districts MUST have a voice in what happens to their schools. No one knows the needs of a community better than the people who live and work there. Acting Commissioner Cerf and his NJDOE must start listening to local voices in these communities. And if they will not, it is the responsibility of this legislature to compel them to do so on our behalf. Parents just like me from across the state are coming together to support and learn from each other. We are growing in numbers and we are not backing down. We will continue to demand a seat at the table when decisions are being made about our children’s education. Albert Shanker; Man Or Myth? Today I received a comment on my post, Edith Shanker Puts Laura Waters, Chris Cerf, & Joel Klein In Their Place. I'm writing as a great fan of Newsworks to convey my dismay in your support of Laura Waters as a reliable voice in educational matters. I chose to repost this comment rather than just respond to it because Jennie says something here that many of us in New Jersey have been saying to the powers that be at NJSpotlight, the first online news service to feature Laura Waters, and now NewsWorks (who has a "content partnership" with NJSpotlight and apparently took Ms. Waters as part of the package). Why, oh WHY are you giving a platform to someone whose work is quite often significantly off-base, and just plain wrong? If Albert Shanker was alive today he'd still be an education reformer and would support NJ's efforts to expand school choice for poor urban students. The trouble with many of Ms. Waters's "opinion" pieces, is that she often presents her ill-researched, ill-conceived opinions as "fact." And, as we have seen time and time again, she does not like to be called out on it. Especially not by one the nation's leading authorities on education. I have read all of Al Shanker’s columns as well as his speeches about charter schools. What I wrote was documented, not based on opinion or hearsay. I knew Al Shanker well. I did not speculate about what Al Shanker might believe today, but what he wrote and said when he was alive. If Ms. Waters refused to believe Dr. Ravitch, I thought perhaps she would believe Edith Shanker, Albert Shanker's wife. Who could have guessed that Jennie Shanker, his daughter, would lend her voice to the conversation? She confirmed not only that Ms. Waters was dead wrong in her OPINION about what Albert Shanker would support if he were alive today, she made it crystal clear that Diane Ravitch is walking the path her father walked, not the so-called reformers. As his daughter, I treasure the testimony of individuals who knew my father and his work. Lately, it has been, frankly, dreadful to find his name associated with school "reform" that undermines public education. Without exception, these articles offer a few short quotes in evidence, always inappropriately pulled out of the context of his true mission and life's work. Calls erupted on Twitter for Ms. Waters to apologize to Dr. Ravitch and the Shanker family. Did she have the courage of her convictions to do so when she was shown unequivicolly that she was wrong. Instead of respond to the criticism, Ms. Waters treated us to a "LOOK OVER THERE!" piece, which completely evaded what the hubbub was really about, and obtusely pondered why there is so much controversy over charters in New Jersey. And in her piece that provoked the controversy to begin with Ms. Waters revealed that in her house growing up, Shanker was like a God. For teachers in New York City (I had two for parents) Shanker was practically a deity, the educator's saint. Our neighbors lit candles for Mother Mary; we davened to Albert. Ah, yes Ms. Waters, that is one thing you are right about! You were being presumptuous. I'm going to bet Diane Ravitch did not worship an idealized version of Shanker. She was indeed his colleague, and Edith and Jennie Shanker are his family. You however seem to have turned Albert Shanker into an infallible God, and you seem to have remade him in your own image. Albert Shanker was a real man, with real ideas, and the women who knew him best made it clear that you are dead wrong about what he would think if he were alive today. To have them tag team you and show you the error of your ways must have been very difficult to absorb. I see the double bind you're in. I really do. To admit you were wrong about Shanker is tantamount to admitting that it is actually you who are wrong about the "reform" agenda currently sweeping New Jersey. And most of all, to admit you were wrong is to admit that Diane Ravitch is right; that the biggest problem with charters is that they are being used to privatize public education. However, you owe it to Albert Shanker's family, and your readers, to admit that you created your own mythical version of the man, and used that version to justify your misguided opinions, while ignoring the facts. Edith Shanker Puts Laura Waters, Chris Cerf, & Joel Klein In Their Place. I am floored by the utter arrogance of this statement from Laura Waters. Jersey Jazzman already did a great job of telling Laura Waters how preposterous it is for her to state as "fact" what Albert Shanker would or wouldn't think, feel, or do. Before Water's derided Dr. Ravitch, who she acknowledges was a colleague of Shanker's, perhaps she should have talked to someone else that actually knew Shanker. Not too long ago, she put Joel Klein in his place when he too invoked Shanker to fortify his position (funny how both Klein and Cerf have tried...) Here is what Edith Shanker had to say to Klein. So, Ms. Waters, I have a few questions for you. Does Edith Shanker sound angry to you too? Because neither Dr. Ravitch nor Mrs. Shanker sound angry to me. And unlike you, they sound informed. It is also interesting that in your piece you reveal that you actually have a great deal of respect for Albert Shanker. If that is true, I suggest you head the words Mrs. Shanker had for Mr. Klein which are just as apt for you. Perhaps you should take a cue here from Shanker's widow and refrain from invoking his name to justify Cerf's words and deeds. I am sure Edith Shanker is no less offended that you and Cerf are using her late husband's name to justify how Cerf tramples the wishes of communities in this state to give his crony's charter schools and open our state's coffers to discredited for-profit companies. Please, if you read Jersey Jazzman and my blog, and agree with our criticisms of Ms. Waters piece for NewsWorks, please consider contacting them to let them know they should reconsider giving her poorly researched opinions space on their website. United States DOE Awards Over $2M to Four Charters That Will Never Serve A Single Student! Just a quick post today to point out something rather striking. Last October, my battle against Tikun Olam hit the national stage when the United States Department of Education's Office of Innovation and Improvement awarded "Friends of Tikun Olam", a non-profit started by the lead founder, a $600,000 federal grant. 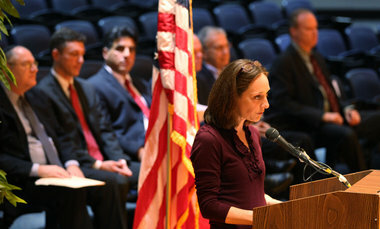 They were not the only New Jersey charter awarded funds. The Shalom Academy, Spirit Preparatory Charter School, and Bright Horizon Charter School, each received similar or slightly smaller awards as well. Every single one of them has been denied by Acting Commissioner Cerf. Tikun Olam's fourth application was denied approval. Spirit, Shalom and Bright Horizon were all denied their final charter by Acting Commissioner Cerf on Monday. This means the USDOE is 0 for 4 in New Jersey. Stellar job there guys. You may want to go back and look at your criteria for awarding grants. Or maybe, how about waiting to award them until applicants actually have their final approval? Otherwise, that's a whole lot of money spent that NEVER reaches a single student. Luckily, Tikun Olam's funds were never dispersed because we were able to stop them in their tracks before they received approval from the state. However, we were told that if they gained approval in another round, the funds would still be at their disposal. This didn't sit too well with the good people of Highland Park, and lots of us contacted Congressman Frank Pallone and asked for his help. The Congressman intervened, and recently informed us that the grant for Tikun Olam is in the process of being "closed out," saving taxpayers $600,000 and ensuring Tikun Olam can't continue to reapply with a $600,000 federal grant in their back pocket. But what about the funds for the other three charters that have now been denied? Have the first year amounts already been dispersed? That's $585,661 dollars, quite possibly already spent by the USDOE, and again, not a single student has been educated. I called the Director of the USDOE's Charter Schools Program, Stefan Huh, and asked him if the funds had been dispersed, and was asked to put my request in writing so it could be shared with his office. He said they would advise me whether or not they could just answer my question, or whether I need to submit a Freedom Of Information Act request. I guess information is less free when it makes the USDOE look like they don't know what they're doing with our tax dollars. What's The Cost Of Four Cyber Charters in Newark? $17.5 Million. Yesterday we took an in-depth look at how Benjamin Rayer was able to get his cyber charters approved. Today I want to take a look at how the state managed to push FOUR cyber charters through, all in the same city, including one that will ultimately serve the whole state but initially pulled all of the start-up funds from Newark. Before we get started, let's look at where the NJDOE couldn't get one through, and why. The Garden State Virtual Academy, if approved, would have taken $15.4M out of Teaneck's budget for 1,000 students that ultimately would have been drawn from the entire state. But because the drop-in center would have been in Teaneck, and the Lead Founder was from Teaneck, the district would have footed the ENTIRE bill for the first year, until it was determined where the 1,000 students actually came from. And that wouldn't happen until October 15th, well after the school year began, which would have meant drastic cuts to the budget. When the parents and residents of that town learned what was happening, they became a force to be reckoned with! I love the quote from Dr. Henry Pruitt at the end. At the time he was a Teaneck School Board Member, but was just recently elected to Teaneck's Town Council. He is a former teacher and principal, and he gets what is going on. If the state wants a charter school, they should find a way to pay for it. Truer words have never been spoken Dr. Pruitt! The proposed budget for the Garden State Virtual Charter School calls for a small drop-in center to be located in Teaneck, but it would otherwise focus on home school students across the state. The application and the issues surrounding it became such a hot potato that the NJDOE cut Garden State Virtual in the middle of an application cycle, which had NEVER been done before. So, if you can't make a statewide virtual charter work in Teaneck because the parents, residents, superintendent, school board, politicians, and press will have a field day with the ridiculousness of a $4.7 million bottom line, where can you put one? Where the Mayor is an outspoken cheerleader for everything and anything reformy. Where the Senator, who clearly sees what's going on in education, is bullied by the Governor. Where the superintendent reigns supreme over the Advisory Board, elected by the parents and residents of Newark. Where the state refuses to let go of it's control of the public schools, and isn't above tanking the QSAC scores to maintain it's choke hold. This, and this alone, explains how four cyber charters may be opening in Newark this Fall. There is no local control and no local voice. It has been snuffed out. So, how much is this going to cost NEWARK? 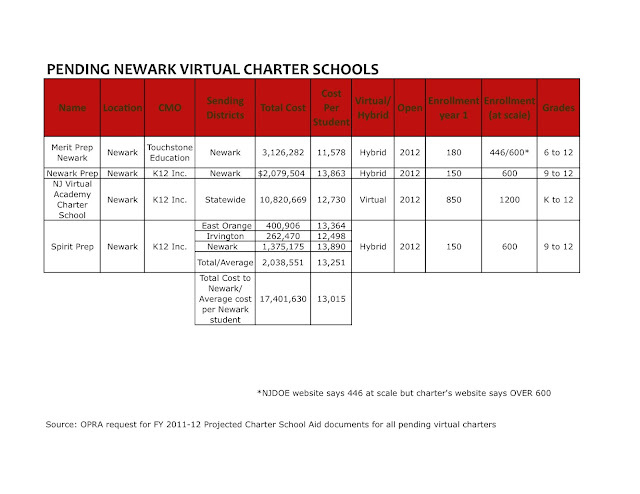 Here is a chart I made, which details the four cyber charters pending in Newark, the cost to the district as a whole, and the cost per student. The Pennsylvania Department of the Auditor General, Jack Wagner, just released a report titled "Charter and Cyber Charter Education Funding Reform Should Save Taxpayers $365 Million Annually," in which he detailed the spending per pupil in states where cyber charters are already operational. He found that the cost per student ranged from a high of $12,657 in Pennsylvania to a low of $7,671 in Arizona. I stumbled upon the actual funding and expenditures for the Arizona Virtual Academy, run by K12 Inc., which will run the NJ Virtual Academy as well. It states that they spend $7,164 per student. So, why are they going to get $12,730 per student in New Jersey??? I haven't delved into how much profit K12 Inc. is making off the Arizona Virtual Academy, but we will assume there is profit being made, even at $7,164. But for the sake of argument, I'll ignore that for right now. Let's pretend every dime of that money goes to the students at Arizona Virtual Academy. Let's just look at how much more we will be paying in NJ if Cerf doesn't stop this nonsense. Newark has had to set aside $10,820,669 for NJ Virtual, an incredible $12,730 per student. That's $5,566 more per student than in Arizona, for the services of the very same CMO. Multiply that by the 850 prospective students, and you get a net profit of $4,731,100, the same profit for the Garden State Virtual Academy in Teaneck. So that's how you do it. Just put your cyber charter in a district where the collusion runs so deep, it may never come to light how much money is being scammed from the taxpayers. Teaneck taught us that without outrage, there is no change. The entire state needs to be outraged about what's happening in Newark.